We Happy Few has been successfully funded on Kickstarter by 7,433 people, for a total of $334,754 CAD. A game of paranoia and survival, in a drugged-out, dystopian English city in 1964. From the studio that brought you Contrast. We Happy Few is the tale of a plucky bunch of slightly terrible people trying to escape from a lifetime of cheerful delusion. Set in a drug-fuelled, retro-futuristic city in an alternative history 1964 England, you'll have to blend in with its other citizens, who don't take kindly to people who don't abide by their not-so-normal rules. It's a first-person game, set in a procedurally generated, fully 3D city that you must escape before society collapses around you. But, like any good roguelike, you're probably going to die a few times before you figure out how it all works. You will need to learn how to conform and avoid suspicion. You will need to hunt for supplies, and craft the devices and weapons that enable you to make it out of town alive. What do the Wellies approve of you doing? What makes them suspicious? What turns them into a homicidal mob? And is there anyone here who can help you? 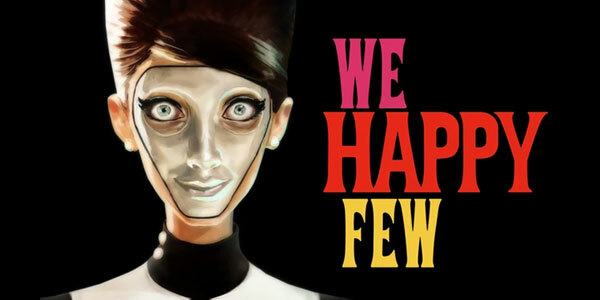 According to its Kickstarter, We Happy Few may make an appearance June 2016. View the Kickstarter page: https://www.kickstarter.com/projects/112359230/we-happy-few-welcome-to-wellington-wells-you-saucy/description.